Dr. Chris Mathison is committed to helping those who suffer from sleep apnea in Fargo, Moorhead and the surrounding communities. In order to best treat these patients, he has dedicated himself to understanding every aspect of this condition and has become highly skilled in the area of dental sleep medicine. Whether you suffer from sleep apnea or simple snoring in the Fargo and Moorhead area, call Dr. Mathison today for relief from this potentially dangerous condition. Dental sleep medicine is an area of dental practice that focuses on the use of oral appliance therapy to treat sleep-disordered breathing, including snoring and obstructive sleep apnea (OSA). Dentists work together with sleep physicians to identify the best treatment for each patient. 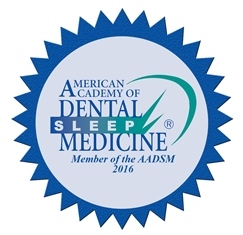 Dr. Mathison is a member of the American Academy of Dental Sleep Medicine (AADSM), the only non-profit professional association dedicated exclusively to the practice of dental sleep medicine. While some obstructive sleep apnea patients may require treatment with a CPAP machine, those with mild to moderate cases typically find success with the use of oral appliances. If you're a candidate for this treatment, our dentist provides customized and comfortable oral appliances for his sleep apnea patients in Moorhead. Oral appliance therapy is an effective treatment that is covered by most insurance plans, and the appliance itself is similar to a mouth guard. It is worn while you sleep and holds your jaw in a position that widens your airway, preventing pauses in breathing. In addition to treating sleep apnea, oral appliances can also prevent or reduce snoring, which is often caused by mild airway obstruction. If you suffer from sleep apnea in the Fargo or Moorhead area, put yourself in good hands. Call Dr. Mathison today! AADSM membership provides Dr. Mathison with access to educational resources and practice management tools that help him/her better serve his/her patients by providing the highest quality of care in the treatment of snoring and obstructive sleep apnea. For more information about AADSM, visit www.aadsm.org. "I have had many nights of sleep that have been interrupted due to my sleep apnea, leaving me feeling tired and lethargic all day long. I met with Sleep Specialists and they diagnosed me with sleep apnea and prescribed a C-Pap Machine. I had struggled with my C-Pap Machine leaking air and not fitting right for years. I tried so many different masks and I could not resolve the issue of air leaking and waking me up! I was frustrated with the constant nature of the air leaks and my sleep issues were unresolved. My Sleep Apnea Doctor recommended that I try an oral appliance and referred me to Dr. Chris Mathison. I met with Dr. Mathison and he had numerous options for me to try. His knowledge, patience, and expertise were truly appreciated. Dr. Mathison was able to find an oral appliance that was "just right" for me! I could not believe how amazing and energized I felt every morning when I woke up! I never knew that I could feel so refreshed in the morning. My husband has called the mouth appliance "A Miracle!" What a blessing it has been to resolve my sleep issue."